Click on download for scope and sequence of the Go Phonics Readers. Over 90 stories are 93% decodable, cumulative for ongoing reinforcement. Students apply phonics skills in reading as they are taught, always making that connection. This is key to reading success. Each code is taught, practiced, then applied in real life stories students can really read. Go Phonics does this with 7 storybook volumes (600+ pages) that support phonics lessons in an Orton-Gillingham based sequence that minimizes confusion. Go Phonics practice tools prepare students with 50 phonics games (fluency, accuracy, vocabulary) and worksheets (phonics and the story's language arts). 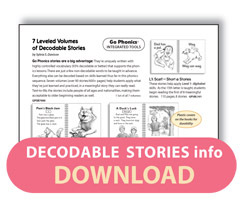 Download Go Phonics Overview for catalog, scope, sequence, sample stories and lessons. Good, decodable text is why we chose Go Phonics. I wanted a phonics program with books our kids can really read, and practice sounding out meaningful text. Otherwise they just memorize, or stumble and guess (which hurts comprehension). In Go Phonics lessons they’re applying new and previous skills in a delightful story—over 90% decodable. That’s about as pure as it gets in decodable text. Even my adult students love Go Phonics readers! I teach children and 30 to 40-year old adults as well. Your books are precious to them. They’re funny, text to world, include science... You introduce the mechanics of our language at a very early level. You have prepositional phrases... The stories get longer as you get more advanced, so they can do book reports. I truly have not seen anything that matches your books for teaching beginning reading on a phonics level. Go Phonics readers helped streamline my guided reading. Go Phonics gives me a clear progression of skills, lots of practice, and flexibility so I can have more students in a level and fewer reading groups. I use our (school’s) leveled books for additional reading practice.